Lares Trek To Machu Picchu 4 Days, one of the best and marvelous treks after the Classic Inca Trail, this alternative trekking leaves from Cusco through the Lares Valley and finishing in Machu Picchu, that provides access to the high Andean regions of Vilcanota Mountain Range in Cusco, Lares Trek To Machu Picchu. Preserves an variety of flora and fauna, with a unique dramatic scenery, while trekking we come upon, Andean villagers wearing traditional ponchos and typical costume, Lares Trek To Machu Picchu also known as “the route of the famous Andean weavers,” we can find local people weaving, (handmade). Having the chance to interact with these precious indigenous people and their children, experienced a bit of their culture and traditions. 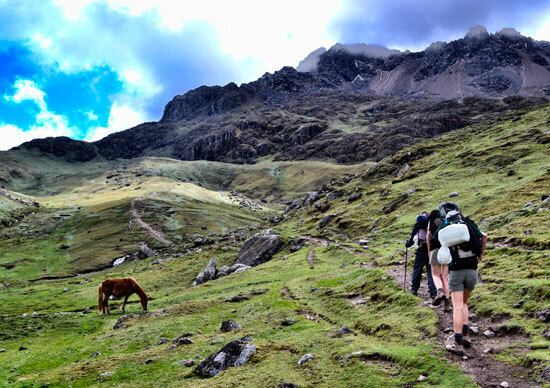 Lares Trek To Machu Picchu, On this incredibly picturesque trek we recommend this expedition and adventure to you as one of the best vacation treks to Machu Picchu, this Lares Trek To Machu Picchu, four days trek does truly an alternative that take you off the beaten track! We leave Cusco early by private bus, traveling through the Sacred Valley until we reach the hot springs in Lares; we spend the morning in the medicinal springs and, after lunch, we walk for 2 hours to our campsite in Wacahuasi (3,700 m.a.s.l.). 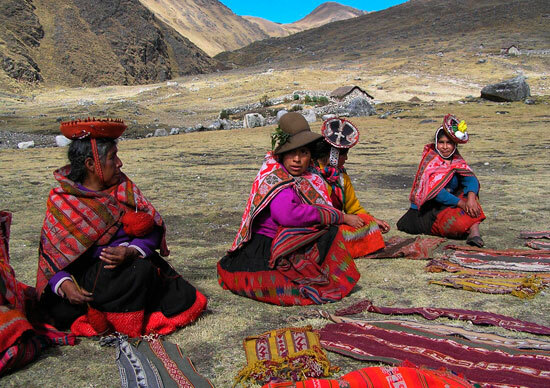 After breakfast we observe the local artists´ ability and knowledge in producing fine wool weavings from alpaca wool, considered some of the best in all of Peru; the weavers create wearable goods, carpets, ponchos and other articles. We then begin our hike to the Pass of the Condor at 4,100 m.a.s.l., from where we have a sensational view of La Veronica, a glacier of 5,750 meters height. After a slow 1-hour descent to Lake Epsaycocha, we set up camp for the last time. Our descent leads us to Patacancha, an Andean community known for its weavings and weavers; from here we continue to Willoc where we rest and have lunch; from here it takes us 2 hours to reach Pumamarca with its Inca terraces, and finally we arrive in Ollantaytambo. Located in the Sacred Valley of the Incas, next to the Urubamba River, this Inca people is considered to be one of the better preserved living museums due to its still living population. Later we continue on to Aguas Calientes where we overnight in a hotel. We leave early, after breakfast, to reach Machu Picchu, and then the first bus up from Aguas Calientes to the Historic Sanctuary of Machu Picchu. During a private, 3-hour guided tour throughout the Citadel, we visit all the important sites and documents. After the tour you will have time to walk around and explore this Wonder of the World. In the afternoon we return to Cusco by train and you will be transferred to your hotel from the train station. Transport: Cusco – Lares / Aguas Calientes – Cusco. Hostel en Aguas Calientes – Machu Picchu. Not included Huayna Picchu mountain (Optional). Arrive in Cusco at least two days before your trek to acclimatise. Do not take this warning lightly. we do not want members of our team ill or with altitude sickness, affects everyone differently. 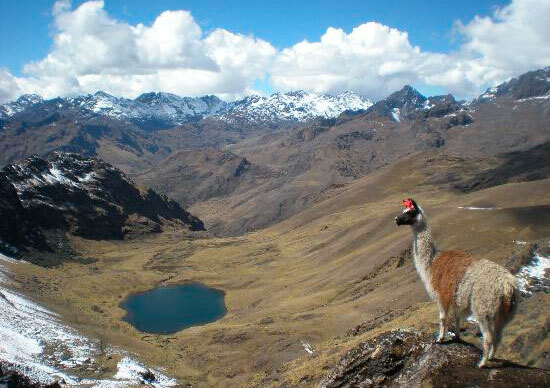 With the Lares Trek the highest point is 4650m (15255 ft) ABOVE SEA LEVEL. then you see a peaceful lake and dramatic scenery you swiftly forget any ailment. Muña tea treatment (andean mint). Muña is a popular herb from the andean mountains, that can be used fresh or dried and in infusions. Muña also has one of the highest antioxidant capacities of any food, perfect to regularize your metabolism in this altitud does not have limitations, it can be drink in any time and tastes fresh, for a boost while at the high heights. Additional Tips And Optional Costs in Lares Trek To Machu Picchu. We suggest some tips for a best trekking. Walking sticks for $15 / £10.24. A good daypack: Eagle Creek Afar Backpack –appropriate packs to carry your personal belongings. 2 pairs of trekking pants: 1 hiking, 1 cotton–which is just enough. 1 rain jacket: (first night – 5 degrees Celsius/41 degrees Fahrenheit. The rain jacket can be helpful, even if we are in dry season! Thermals: wool socks, gloves, scarf, and woolen hat for cold nights. 3 pairs of underwear, 4 pairs of socks, so you want to make sure you’re not too cold or overheat. 1 good sleeping bag liner that is super lightweight and easy to pack. for altitude sickness. the coca or the Muña tea are very helpful in alleviating the symptoms. Sun protection cream (SPF 45 or higher recommended). bugs seem to bite you no matter what kind of spray you put on, so an anti-itch medication could be helpful. Water (only for first day hike). Then we will provide you with water throughout the hike. Toiletries: toothbrush, toothpaste/floss, shampoo/conditioner, brush/comb, Vaseline (for potential blisters), feminine hygiene products. Medication (Imodium AD or something for your stomach. so bring some meds. GROUP SERVICE: US$ 669. p/person. We are building small groups for a new date of hike according the date you request. We required at least two hikers! consult previulsly with your seller. Andes Path Peru, based in Cusco, do not share its groups with third parties. PRIVATE SERVICE: US$ 739. p/person. Responsible Lares Trek 4 Days operator, specialists, working with native communities, passionate and committed to Sustainable service.